Treat yourself to an unforgettable evening full of cozy conversation and delicious food in a one-of-a-kind alpine setting. 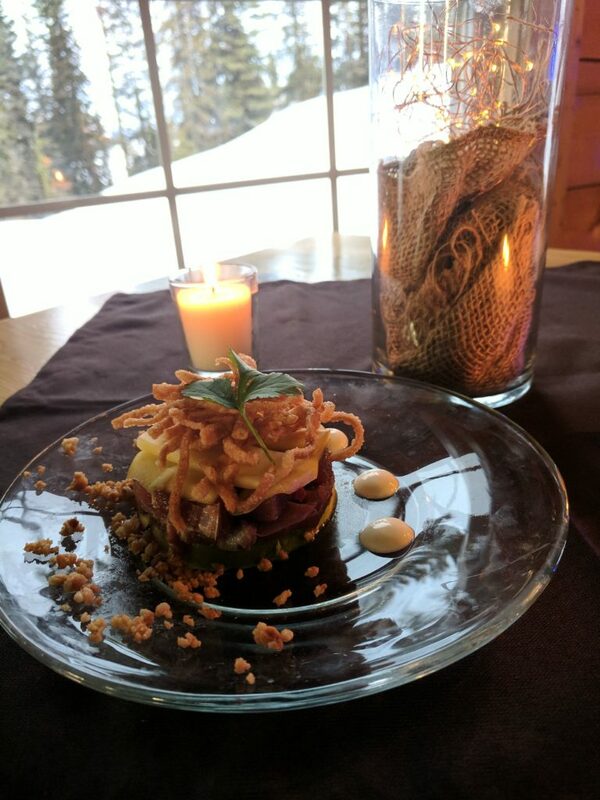 The popular ‘Bears Den Dinner After Dark’ pairs a spectacular four-course meal with an alpine adventure to a mid-mountain outpost. The journey begins as you step aboard a SnowCat in the base area. After a short uphill trek, you’ll arrive to a warm welcome at the Bears Den. Enjoy a complimentary drink – like our mulled wine with cardamom-crema – as you settle in and prepare yourself for a dining experience like no other. The four-course meal features seasonal fresh dishes lovingly prepared by Executive Chef Devin and his team. 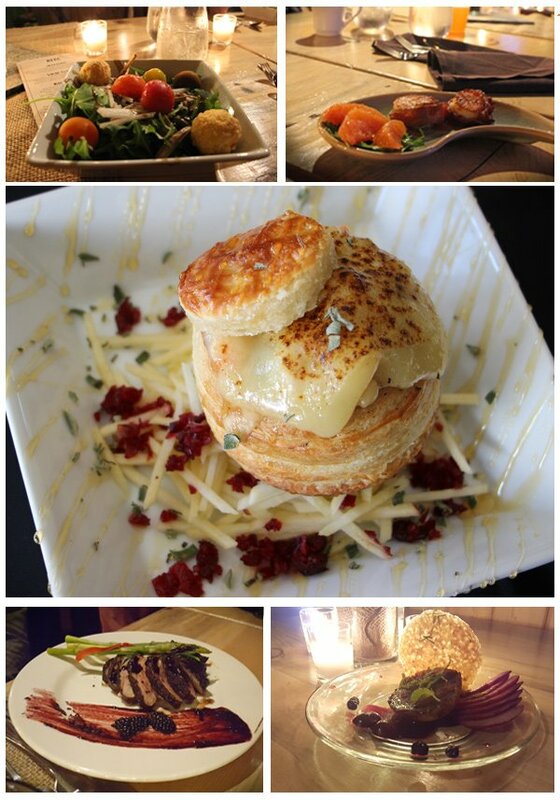 House wine and craft beer selections to accompany your meal are included. After-dinner sippers are also available for purchase. Menus rotate for our snowcat dinner events. If you’d like to book a private event for your group, you can choose from our seasonal options. 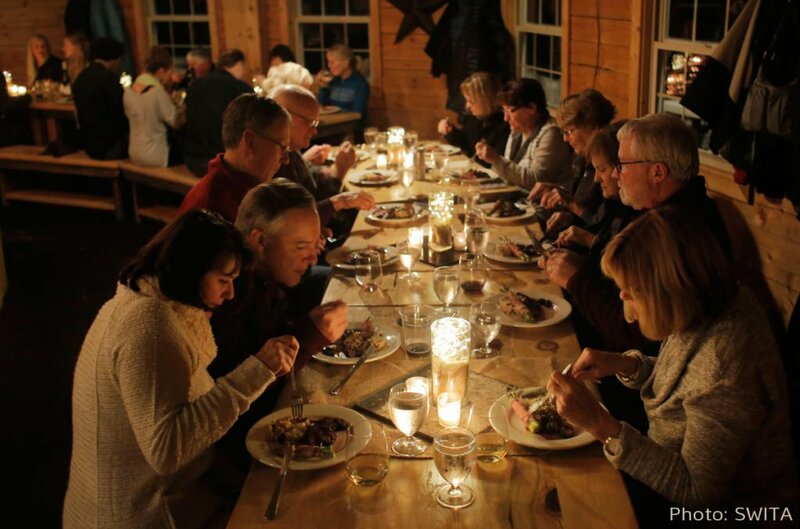 The meal is elegant, but the rustic setting naturally encourages relaxation and connection with your fellow adventurers. 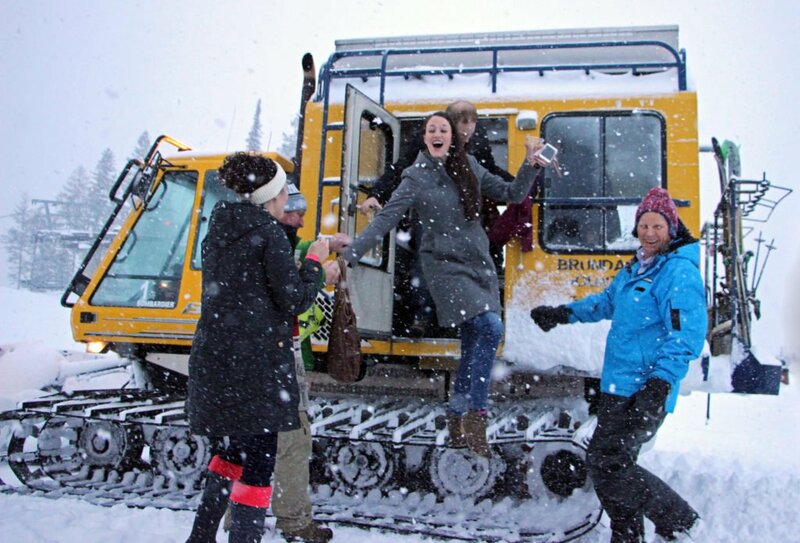 Guests arrive at the Brundage Lodge at 5:30 with the first SnowCat departing at 6:00. Dinner service begins at approximately 7:00 pm. You can expect to arrive back in the base area between 9:00 – 10:00 pm. $145 per person, includes tax and gratuity. Or – Call 208-315-3080 or e-mail [email protected] to reserve your seat. If you have a group of 12 or more, we will book a custom ‘Dinner After Dark’ just for you. Available Mondays through Thursdays during ski season. Call Michael at 360-620-7100 or e-mail [email protected] for available dates and menu options. We can also arrange for shuttle transportation for your group if desired. Please be aware that our kitchen facilities produce menu items that may contain peanuts, almonds, tree nuts, soy, milk, dairy, eggs and wheat. While we take steps to minimize the risk of cross contamination, we cannot guarantee that any of our products are safe to consume for people with peanut, almond, tree nut, soy, milk, egg or wheat allergies.